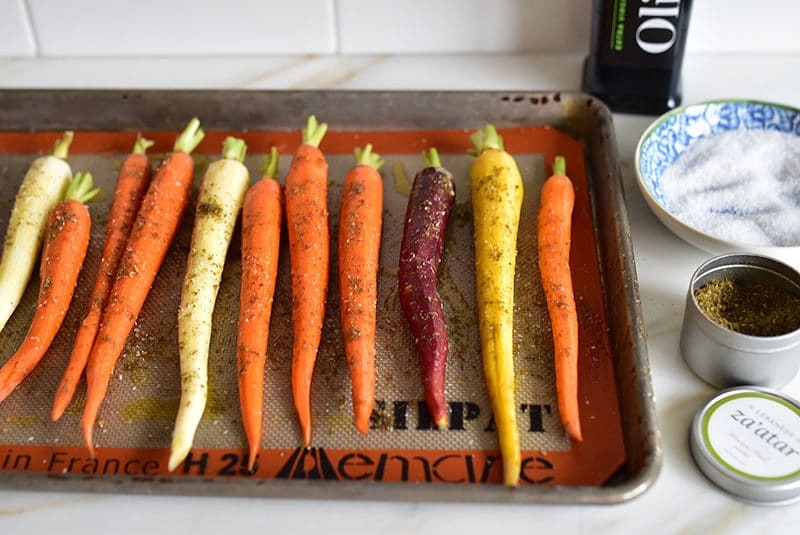 Za’atar Roasted Carrots are a simple way to give roasted carrots a boost of exciting flavor with za’atar spice, the Lebanese spice blend of wild thyme, sumac, and sesame seeds. Dust carrots with za’tar both before and after roasting. Perhaps like you, I do a good bit of cooking for a crowd. Even if it’s a small group of the closest family members—or especially so—I like to have as much ready as possible when they arrive so everyone can relax. Because I always learn and relearn that though it seems like a good idea to cook and put the finishing touches on together, in my experience it can divide up the group and we don’t spend as much time all together as I’d like. One of my great takeaways from M.F.K. Fisher is that she didn’t pay much mind to the temperature of the food, so long as she had it completed far enough in advance of her guests’ arrival that she could relax, take a breath, and welcome them at total ease and without immediately excusing herself to the kitchen after their arrival. Thanksgiving is a little different in that there is so much cooking that there will still be so much cooking as and after guests arrive. But still, my mindset that I can make ahead even the roasted vegetables gives a certain peace of mind. Here the turkey is finishing up its aromatic roasting, and the oven can be free for warming and holding. Also, doesn’t matter if you have one oven, or two ovens (Mom’s extra was in the basement, where she and Sitto baked), or what the heck, three. They’re still always going to get filled up, so anything that will take an advance roasting or baking, we’re doing it. These za’tar roasted carrots are at home on any holiday table, or any Sunday table, or any table table. 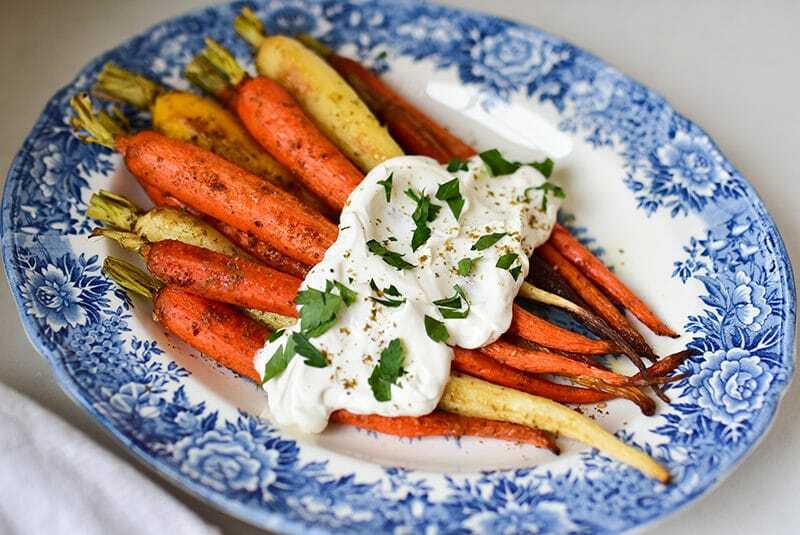 The sweetness of the carrots is concentrated in the roasting, and the drizzle of honey, dusting of za’atar, and finish with bright herbs are a mouthwatering symphony. I tasted carrots with labneh at the RH showroom bar in Chicago (I mean, what a spot! ), and then bonfire-side this past summer, my sister-in-law Diane described a glory of a platter of roasted carrots she’d made. The way she can talk any food makes you want to run, not walk, immediately to market to buy your carrots or whatnot so you can experience what she did. Also, these carrots hardly require a recipe. It’s all about one-pan drizzling of your good olive oil, dusting of za’atar, roasting, then drizzling with honey while warm and finishing with a dollop of labneh and a flurry of herbs when the za’atar roasted carrots are served. Scale the quantity up or down with ease, and go vegan by leaving off the labneh. 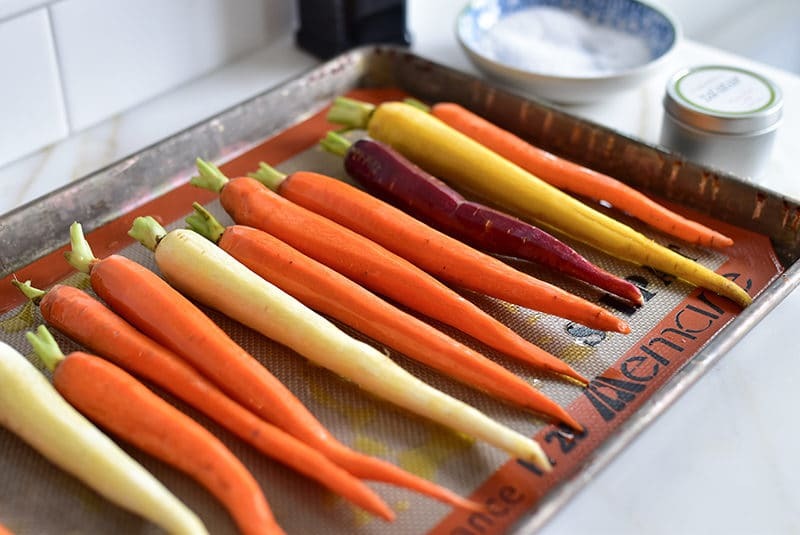 The carrots can be roasted in advance, and served reheated or at room temperature. Add the labneh topping just before serving. Roasting time for the carrots depends on their size. For carrots about an inch thick, plan on about 30 minutes. Pierce the thick end with a sharp knife to be sure the carrots are cooked through. A silicone mat works really well here, to prevent sticking and encourage even roasting. Scale the quantity up or down with ease, and go vegan by leaving off the labneh. Heat the oven to 400 degrees and line with a Silpat, nonstick foil, or parchment. Lay the carrots on the pan and drizzle a couple of tablespoons of olive oil over the carrots, rolling them to coat them completely. Sprinkle with a light dusting of za’atar and salt. Roast the carrots for about 15 minutes, then turn them over and roast for another 15 minutes or until a knife pierced through the thick end of a carrot meets no resistance. 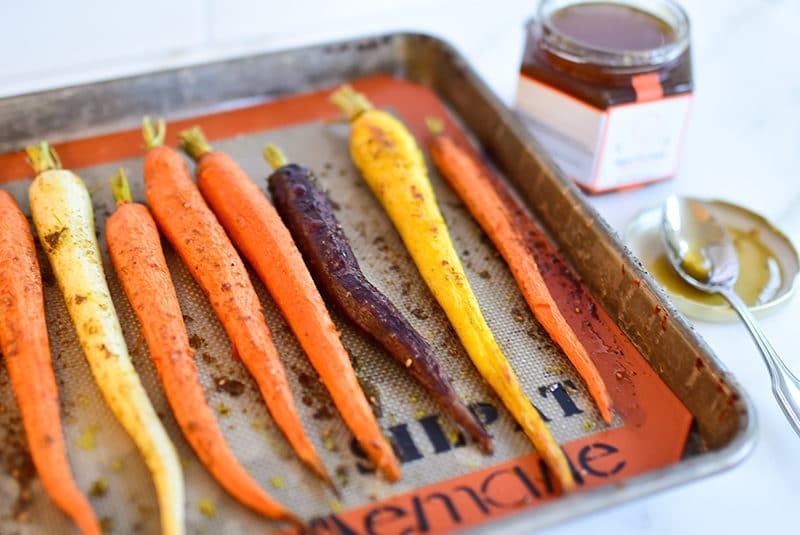 Remove the carrots from the oven, and drizzle with a light coating of honey. 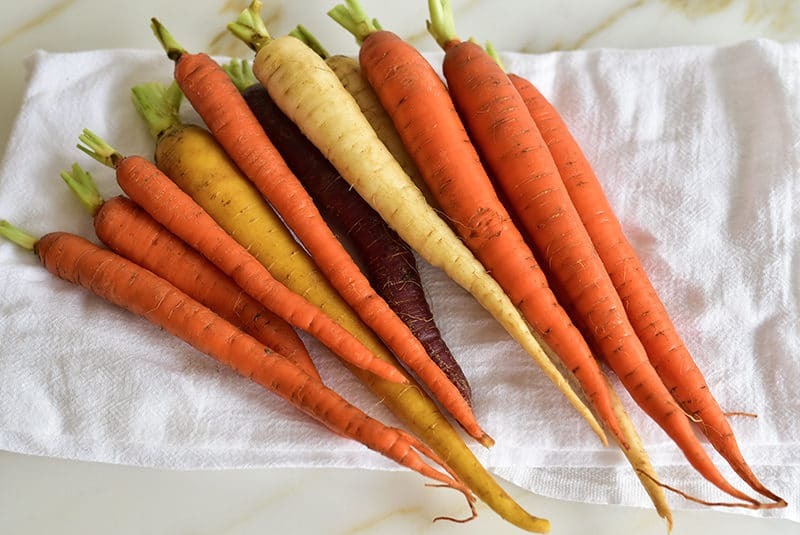 When you’re ready to serve the carrots, arrange them on a platter. Dollop the labneh along the narrower end of the carrots and top with the chopped herbs. Serve immediately.